이 비석은 묵재(黙齋) 이문건(李文楗)이 부친인 이윤탁(李允濯)의 묘를 모친인 고령(高靈) 신씨(申氏)의 묘와 합장하면서 1536년에 묘 앞에 세운 묘비이다. 이 묘비에는 앞면과 뒷면에 각각 묘주의 이름과 그 일대기가 새겨져 있고, 왼쪽과 오른쪽에도 한글과 한문으로 경계문이 새겨져 있다. 이 비석의 특징적 가치는 비석 왼쪽 면에 쓰여진 한글 경고문인데, 우리나라 비문으로서는 한글로 쓰인 최초의 묘비문으로 알려져 있어 그 역사적 가치가 높으며 국어사에 중요한 자료가 된다. 이 ‘한글영비’는 국어생활사에서 다음과 같은 중요한 가치를 지닌다. 첫째, 중종 31년(1536) 당시 한글이 얼마나 널리 알려져 있는가를 증명해주는 자료이다. 둘째, ‘한글영비’에 새겨진 한글의 서체는 훈민정음이 창제된 직후의 서체, 즉 의 서체와 서체의 중간형의 성격을 지닌다. 셋째, 이 비석의 글은 비석의 이름인 ‘영비(靈碑)’를 제외하고는 국한 혼용이 아닌 순 국문으로 쓰여 있다. 본격적으로 한글로만 쓴 문헌은 18세기에나 등장하나 이 ‘한글영비’는 16세기에 이미 순국문으로만 쓰인 문장이라 할 수 있다. 넷째, ‘한글영비’는 언해문이 아닌 원 국문 문장이다. 15세기 이후 한문 원문을 번역한 언해문이 한글자료의 주종을 이루었으나 이 ‘한글영비’는 짧은 문장이긴 하나 처음부터 우리말로 쓰인 문장으로, 한글이 한문 번역도구가 아닌 우리의 생각과 느낌을 직접 전달하는 도구로 변화하였음을 증명하는 것이다. 다섯째, ‘한글영비’에 쓰인 국어 현상은 이 당시의 언어를 잘 반영하여 당시 국어를 이해하는 데 도움을 준다. 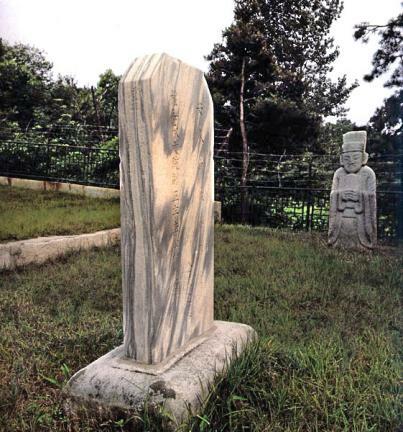 This is the oldest known tomb stone carrying an inscription in Hangeul (Korean alphabet). It was erected in 1536 by Yi Mun-geon in front of his parents' tomb after interring the remains of his father, Yi Yun-tak, and his mother, Lady Sin from Goryeong, who had been buried in separate graves. The tomb stone is inscribed with the names of the buried couple and their profiles on the front and the back. The sides have warnings against doing damage to the tomb. Particularly notable is the warning in Hangeul inscribed on the left side of the tomb stone, which is known to be the oldest tomb tone inscription written in Hangeul. The tomb stone is important for several reasons. First, it suggests how widely Hangeul was used around 1536. Second, Hangeul carved on the tomb stone represents transition from the initial style as printed in Hunminjeongeum haerye (Explanations and Examples of the Proper Sounds for the Instruction of the People) in 1446 and that in Yongbieocheonga (Song of Dragons Flying in Heaven), which was compiled to experiment the poetic use of the newly invented script and published in 1447. Third, the text for the inscription was written in pure Korean, a remarkable fact considering that the earliest known document written in pure Korean appeared in the 18th century. Fourth, the text was not translated from original Chinese but was written in pure Korean from the beginning. Though a simple short sentence, it deserves attention because most Korean texts at the time were translations from originals written in Chinese characters. It testifies that Hangeul had become a tool for written communication, not just for translation from writings originally in Chinese characters. Fifth, the Korean inscription on this tomb stone is helpful for understanding the Korean language spoken at the time.